It was Halloween in the land of "Mob Wives" and the ladies were eager to celebrate. Carla Facciolo was all smiles while pumpkin shopping with pal Drita D'avanzo, who was set to plan a drama-free party. There's just one problem. Karen and Ramona are having a Halloween party on the same night as Drita. Who would have guessed? 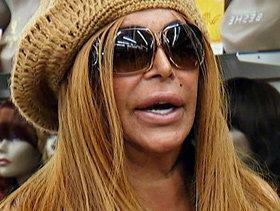 Big Ang got in the Halloween spirit by dressing up as Drita. Carla continued down her path of making peace with the "frenemy" as she met Karen at Silver Lake Golf Course for a round of laughs. Donning sweats and jeans, the two whipped around the golf cart talking costumes, minus Renee, who neglected to show. After Karen apologized for her aggression at their dinner date, she urged Carla to come to Ramona's Halloween party, a night of hookah, celebrity DJs and popping bottles in Manhattan. "Drita's party will be boring. Drita's party will be empty. Drita's party will be on Staten Island. I've said enough," Ramona told the cameras. After picking out a devilish costume with naughty nurse Karen, she said she expected Carla to remain loyal to Drita and not show. Big Ang can't go to either party because she has to work at her bar that night. She told her son AJ over dinner, "I wish I had a rich husband," to avoid working long, late hours. AJ's advice: maybe investing in an additional Ignazio's brick oven pizzeria chain in Florida could be the relaxing trick. When she hit up the wig store with Carla and Drita, she got in on the Halloween fun though. She and Drita swapped roles and dressed as each other mimicking their mannerisms. Renee on the other hand blew a fuse. When she met Carla at Fiori Di Mare restaurant, she wasn't too pleased from the get-go with Karen's tardiness. (At least Karen showed. Didn't Renee completely bail on their golf outing with no notice?) Carla merely mentioned Ramona's Halloween invitation and Renee's eyes bulged. How, how could Carla get invited first? What happened to loyalty? Ramona dared to call Carla first with an invite. Renee would rather lounge on the couch with Junior watching television anyway so the insult could slide. Karen didn't buy it though and took the opportunity to express her concern about Renee and Junior's troubled relationship. Earlier, Renee tried to apologize to sulking Junior for dredging up their past in an explosive therapy session. Why is she the one apologizing for his bad behavior again? When he refused to move on, her apology morphed into a screaming assault. But not to worry, the two lovebirds made up in time for both Halloween parties and dressed as matching prisoner inmates. First on the agenda was Drita's party at Ruby Falls Night Life Cafe Lounge. With Carla doubling as Cher, the gang seemed to be in good spirits. That is, until Junior decided it was time to bounce to Ramona's party in the city and said it in front of hostess Drita. Renee felt the tug of war and wished for a world that consisted of one Halloween party and one Christmas party and one dinner date with all friends present. But alas it cannot be, so off they went to Ramona's hopping club of dancing, drinks and hookah smoke in the city. Their stay was short-lived though as Junior got spooked by an unidentified partygoer who muttered, "I think you might know my friend. He's a cop." Quotable: "You're hurting my eardrums. I don't want to hear you cursing in my face." – Junior Pagan to his ex-wife Renee Graziano following her explosive apology.